Is the number of men in a female’s life written in her genes? Not all scientific questions are boring. As an example of the interesting kind, imagine asking “Why are some animals monogamous, and others not?” That’s the sort of question you would expect a novelist to ask, not a scientist, and perhaps because of this I find it irresistibly interesting. A particularly vivid exploration of this question is being carried out by Professor Patricia Parker, newly-arrived member of the world-class tropical ecology group at University of Missouri St. Louis. Patty Parker studies hawks. For several years she has been carrying out detailed ecological, genetic, and behavioral studies of the hawks that inhabit the Galapagos Islands 1000 km west of South America. Famous for Darwin’s investigations over a century earlier, this cluster of volcanic islands is so isolated that animals only rarely reach it from the mainland. Hawks are a recent arrival, carried in on high air currents from South America approximately 33,000 years ago. Now imagine you are a member of that intrepid group of birds, arriving exhausted and alone on a group of islands with no other hawks or indeed any other predators. Like Robinson Crusoe, you are free to assume whatever life-style you choose. There is no one supervising your behavior, no one to say you should be monogamous. Would you be? The beauty of studying this problem with Parker’s hawks is that on some of the islands like Espanola all the hawks are monogamous, while on other islands like Pinta none are. Instead, the hawks on Pinta are polyandrous: One female is shared by as many as 7 males, all of whom mate with her and all of whom help in rearing the young. Is the choice by a female of one mate or many dictated by the genes of the birds that settled her island? Or does the ecological nature of the island dictate the choice? To investigate this question, Parker and coworkers studied the DNA of the birds. Like all vertebrates, these hawks contain within their chromosomes certain very variable bits of DNA called minisatellite sequences. Minisatellite sequences vary a lot from one individual to the next. In humans, minisatellite “fingerprints” are used to establish the identity of suspects in criminal trials. Parker used minisatellite fingerprints to establish that each of the nine islands on which hawks are found was settled only once. Hawks don’t like to fly over water, and seem to have passed from one island to another only rarely. 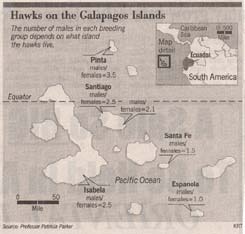 On each of the smaller islands like Pinta and Espanola, the minisatellite fingerprints of the hawks are identical, as if all the hawks on a particular island were clones of a single individual. Each island has its own unique hawk mini satellite fingerprint, so you would know without a doubt that a hawk came from Pinta and no other island by looking at its mini satellite profile. A hint that genes determine the monogamy/polyandry choice came when Parker discovered that the tiny islands that are genetically uniform are also behaviorally uniform — Espanola is entirely monogamous and Pinta is entirely polyandrous. This is just what you would expect if the preference for multiple mates is determined by genes. Monogamy would occur on Espanola simply because its original founder was monogamous, polyandry on Pinta because its founder carried polyandry-promoting genes. But might environmental differences between Espanola and Pinta be responsible instead? One can sort this out by looking at bigger islands. The large islands Isabela and Santiago support much larger populations of hawks, which exhibit far more genetic variation than hawks found on the small islands. These large islands are ecologically diverse, and so could be expected to exert different ecological influences on the hawks. On Santiago, one end of the island is dominated by old lava flows, with little vegetation, while the other end of the island is richly vegetated. The pickings are slim for hungry hawks living on the lava end of the island. Are the hawks living on that end more monogamous? Less monogamous? Parker found that the ecological contrast had little or no effect. The hawks were polyandrous on both ends of the island, and the number of males in a family group was almost identical (2.1 males at the lava end vs. 2.5 at the vegetated end). Comparing the ecology of different islands, Parker found far larger differences in the size of polyandrous groups (from 2 to 7 males) among islands whose ecology was no more different than the two ends of Santiago. Thus it looks like genes do tell the tale, at least among Galapagos hawks. Parker’s work is still preliminary, and there are 4 more islands to be looked at, but the number of males a female admits into her “marriage” seems to reflect the genes she carries, rather than the life she lives.